Get ready for the Black Cultural Archives Summer Celebration & Festival celebrating their 3rd Anniversary. 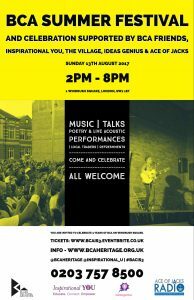 Come and enjoy a fun-filled day consisting of local talent and performers throughout the day from across the diaspora. 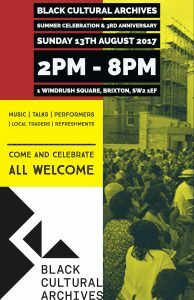 Taking place on Sunday 13th August 2017 from 2.00pm – 8.00pm, the event will take place at 1 Windrush Square, Brixton, SW9 1ES. You can expect to experience music, talks, poetry, live acoustic performance, local traders & stalls, Children’s activities, refreshments and more. This unique event is supported by BCA Friends, Inspirational YOU, The Village, weareUnedited and Ace Of Jacks Radio.